"She's found a way to enjoy life in a way some never figure out." "Emily was a fun-loving seventh grader when she was diagnosed with Ewing's Sarcoma in March, 2010," explained her mother, Mary. Her life was instantly turned upside-down, going from middle school to a hospital room. Emily had to leave school and enroll in an online tutoring program. To help the long hours pass a little quicker, Emily spent time with her friends, her mom, and tried her best to be as much like a "normal girl" her age. After nine months of chemotherapy treatment and missing a year and a half of middle school, Emily started high school. "She has an amazing appreciation of everything," said Mary. "She loves running out the door on a dark, clear night to stare at the stars. We take our dog on walks in the rain and she splashes through the puddles. She constantly wears different socks and different shoes (at the same time) because she doesn't take herself too seriously and likes to be silly." Emily now occupies her time with "regular" activities like school, marching band, and hanging out with friends – not chemo or other treatment. Mary is thrilled her daughter gets to experience life as a typical teenager and says she admires the person Emily is today. "She's found a way, with God, I believe, to embrace all she has and enjoy life in a way that some never figure out." 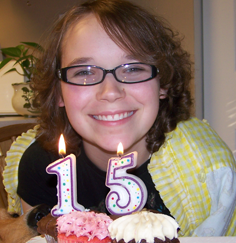 Throughout her journey the NCCS helped Emily's family with transportation assistance to get her to and from treatment. Mary is grateful for the financial help but also for the free webinars the NCCS offers. "I sign up and watch them and really appreciate the information they provide. I always learn new things and feel better being informed. Thank you so much for the information you provide as we continue along this path."